Beneath The Floor Of The White House’s Press Room Is A Decommissioned? Even if you don’t follow U.S. politics, you’ve likely seen the President give a speech at the White House before the press, either out in the gardens or within the White House in a pretty consistent location. That consistent indoor location is called the White House Press Center and it’s located in the West Terrace that links the main structure to the fabled West Wing where the Oval Office is located. Much more interesting than the press room location, however, from a historical trivia standpoint, is what used to be in place of the press room: a swimming pool. 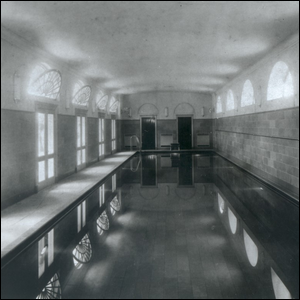 Installed during Franklin Roosevelt’s presidency as a means for him to engage in indoor water therapy and exercise, the pool remained in the West Terrace up until the Nixon administration when Nixon ordered the pool drained and decked over to provide a larger space for the Press Corps. Although the move was a wise one as it radically expanded the space for the press and allowed for a better overall use of the West Terrace, Nixon was also keenly aware of FDR’s popularity as well as how the pool itself was a symbol of FDR’s legacy in the White House. With that in mind, he gave strict orders that the pool be completely preserved so that any future administration could remove the decking and restore the pool to full working order if desired. He even remarked, to be sure the public knew of how respectful he had been of the room, “All the pool equipment is preserved and in storage if a future President wants to put the press outside again.” during his speech at the opening of the facility.